A beautiful Pacific oyster on a bed of coarse sea salt. Photo by Night And Day Photography | IST. CAPSULE REPORT: This is page four of a nine-page article about the oyster. Here, oyster types beginning with C. Click on the black links below to visit other pages. Also visit our many other food glossaries that focus on other favorite foods, including a 13-page Seafood Glossary. The cold waters of Canada produce exceptional oysters, both wild and farmed. On the East Coast, oysters are harvested in New Brunswick, Nova Scotia and Prince Edward Island. Varieties include both Virginicas and the flat oyster. See the separate listings for Cape Breton, Caraquet, Malpeque, Mountain Island Flat, Salutation Cove and Tatamagouche oysters. 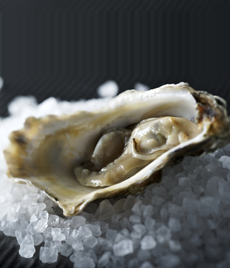 On the West Coast, British Columbia provides Pacific Oysters from Chef Creek, Cortes Island, Denman Island, Fanny Bay, Imperial Eagle Channel, Malaspina Inlet, Nootka Sound and Pearl Bay. A firm-textured, sweet Virginica oyster from Nova Scotia. A farm-raised Virginica oyster that is harvested by divers from the deep, cold water of Aspy Bay, off the northern tip of Nova Scotia. 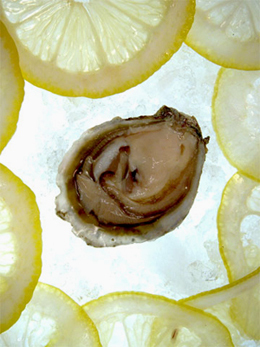 It is a very salty oyster with a delicate texture and a crisp, sweet finish. It is available year-round. Once thriving in Delaware Bay, Cape Mays were decimated due to overfishing, pollution and parasitic disease that began in the Great Depression. Today, due to environmental programs implemented Delaware, New Jersey and Pennsylvania, the oysters are beginning to flourish in the cleaner habitat. 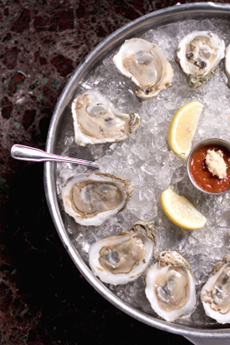 The briny oyster is appearing in raw bars in Philadelphia and along the New Jersey shore. A variety of Virginica oyster from the Caraquet region of New Brunswick, Canada. This plump and juicy farm-raised cold water oyster is known for its sweet, buttery flavor. It is two and one half to three inches in diameter, and is available from May to November. Chef Creek flows into Deep Bay in the Baynes Sound region of Vancouver Island, on the East side of the island—about five miles south of Fanny Bay. This beach-cultivated oyster has a very plump and attractive meat: The flavor starts salty, moves to sweet and has a melon-like finish. It is available from September to July. A variety of Virginica oyster known locally as the native oyster. Once so large and plentiful in Virginia’s Chesapeake Bay that the oyster banks posed a hazard to ships, the stock is now just 1% of its peak level due to overharvesting and pollution. A variety of Virginica oyster named after an island in Virginia where it is cultivated. A dead oyster, so-called because it makes a clacking noise when tapped. A clacker should not be eaten—not because of poison or bacterial contamination, as is often thought, but because when it dies, the oyster secretes an enzyme that impacts the flavor of the meat. Throw it out. A spicy red sauce, generally made by mixing proportions of ketchup and prepared horseradish, to taste. It is typically served with oysters on the half shell. Although the spiciness is a good cover for oysters not at their pristine best, it overpowers the delicate taste of very fresh, fine oysters. See also Mignonette Sauce. This beach-grown Pacific oyster is cultivated in one of British Columbia’s more northerly oyster-growing locations. It is salty and sweet with a fruity finish, and is available from September to July. Oysters with cocktail sauce. Photo by Nathan Maxfield | IST. A variety of Virginica oyster from Nantucket Island, Massachusetts. It is plump with a clean flavor. Oysters can be farmed or “cultured” in a variety of ways. In “suspended cultivation,” they can be grown in nets suspended off the bottom of the ocean floor, by “longline cultivation” hanging horizontally from posts or in mesh cages hanging from rafts. In “rack and bag” (or surélevé), oysters in special synthetic mesh bags (poches) are grown on steel racks in the tidal zone. In “ground cultivation,” oysters are cultivated in deeper water using boats and dredges.